Home Social Kejriwal and the Cartoon: Why the Social Media Overreaction Was Unnecessary. Kejriwal and the Cartoon: Why the Social Media Overreaction Was Unnecessary. #KejriwalInsultsHanuman? Really? All because he shared a cartoon that was already published in The Hindu, one of the leading newspapers of the country? Then what about the cartoonist or the paper itself, or for that matter, the 2000+ people “liking” his post in Twitter and Facebook? Why target the Delhi CM alone? Why did we not have #BoycottHindu or the like trending as well? Although, that would have sounded extremely ironical. Seriously, when are we going to stop making fuss over cartoons?! For the entire past week we have seen JNU related hashtags maintained on social networking sites, while other trending topics have appeared and disappeared. Even TV and print media have been consumed with this topic while providing little room to other happenings. The cartoon hints exactly at this situation. As for calling Arvind Kejriwal a supporter of anti-nationalists because he supported the cartoon, I think that’s too much of indirect linking. The cartoon vaguely suggests that Modi could be the one conspiring/maintaining the uproar at JNU thereby diverting people’s attention from other matters where he could be criticized (like rupee slide, market slump, etc). It doesn’t really call the JNUSU students innocent. I’m not claiming that this portrayal is correct or that Modi is to be blamed, but it doesn’t necessarily have to be. Creative art doesn’t only show straight facts, it also explores the what if’s and how about’s, with most of them being impossible yet funny to imagine. And when it comes to cartoons, we are specifically not supposed to interpret them literally. Moreover, Modi seems to not give a damn about it and is all busy with his development work. 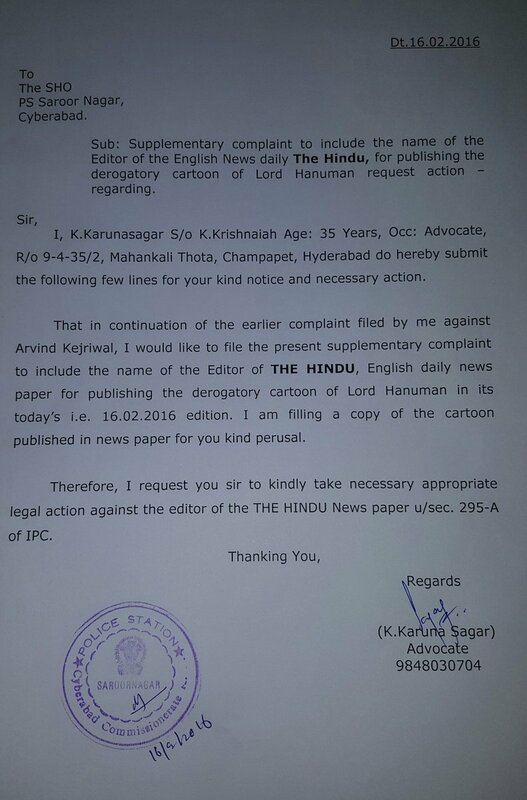 Most of the row has been about Kejriwal sharing a ‘Hindu’ cartoon and not a ‘Muslim’ one. Well, are we done with dividing the nation and the people by religion that now we want to divide art as well? If an artist feels that his concept will work better with the story of a Hindu God, he must have the creative freedom. After all, Hindu religion has 33 crore Gods with millions of mythological tales that boast of covering all possible human situations and providing a guide to deal with them. Also, most of them are very well-known among majority of the nation’s population. Hence, it is, any day, easier for an artist to connect with the readers using references from these stories, than those of other religions. Let us not become so touchy about our faith that we forget to laugh. Bajrangbali himself is known to have better sense of humor in Ramayana. Amidst all our social media overreaction, we have inadvertently made a hero out of this man. 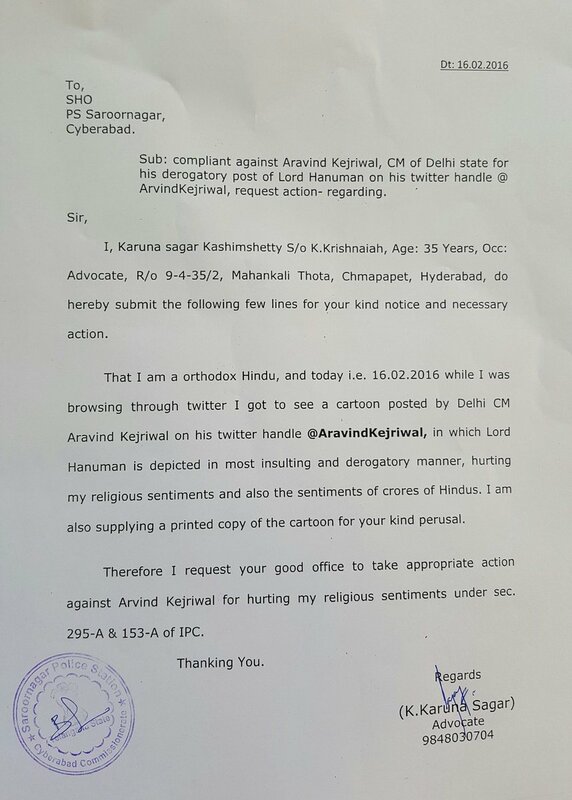 We, the Hindus, fiercely proud of our religious tolerance have virtually stoned him and filed case against him for hurting religious sentiments. Whereas, Kejriwal has seen beyond religion and appreciated the humor. Was this really necessary? Let’s not make him a Charlie Hebdo when he did not even draw the cartoon himself! Give the original cartoonist some credit. C’mon! Why don’t we forget our political biases and concentrate on criticizing politicians on real issues instead of trifling matters like these? Let us know, in your comments, what you think. Next articleGet Service – There Is More To What You Can See!! Seriously!